(Reuters) – A comet blazing toward Earth could outshine the full moon when it passes by at the end of next year – if it survives its close encounter with the sun. The recently discovered object, known as comet ISON, is due to fly within 1.2 million miles (1.9 million km) from the center of the sun on November 28, 2013 said astronomer Donald Yeomans, head of NASA’s Near Earth Object Program at the Jet Propulsion Laboratory in Pasadena, Calif.
As the comet approaches, heat from the sun will vaporize ices in its body, creating what could be a spectacular tail that is visible in Earth’s night sky without telescopes or even binoculars from about October 2013 through January 2014. If the comet survives, that is. Comet ISON could break apart as it nears the sun, or it could fail to produce a tail of ice particles visible from Earth. Celestial visitors like Comet ISON hail from the Oort Cloud, a cluster of frozen rocks and ices that circle the sun about 50,000 times farther away than Earth’s orbit. Every so often, one will be gravitationally bumped out from the cloud and begin a long solo orbit around the sun. On September 21, two amateur astronomers from Russia spotted what appeared to be a comet in images taken by a 16-inch (0.4-meter) telescope that is part of the worldwide International Scientific Optical Network, or ISON, from which the object draws its name. “The object was slow and had a unique movement. But we could not be certain that it was a comet because the scale of our images are quite small and the object was very compact,” astronomer Artyom Novichonok, one of the discoverers, wrote in a comets email list hosted by Yahoo. Novichonok and co-discoverer Vitali Nevski followed up the next night with a bigger telescope at the Maidanak Observatory in Uzbekistan. Other astronomers did likewise, confirming the object, located beyond Jupiter’s orbit in the constellation Cancer, was indeed a comet. “It’s really rare, exciting,” Novichonok wrote. Comet ISON’s path is very similar to a comet that passed by Earth in 1680, one which was so bright its tail reportedly could be seen in daylight. The projected orbit of comet ISON is so similar to the 1680 comet that some scientists are wondering if they are fragments from a common parent body. “Comet ISON…could be the brightest comet seen in many generations – brighter even than the full moon,” wrote British astronomer David Whitehouse in The Independent. In 2013, Earth has two shots at a comet show. 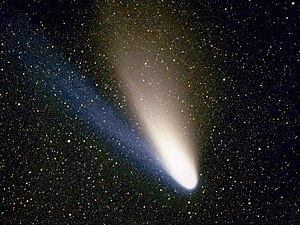 Comet Pan-STARRS is due to pass by the planet in March, eight months before ISON’s arrival. NASA’s Mars Curiosity rover may be able to provide a preview. Comet ISON is due to pass by the red planet in September and could be a target for the rover from its vantage point inside Gale Crater. 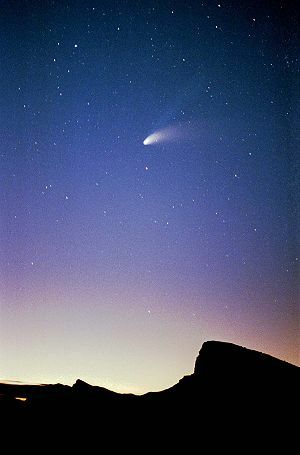 The last comet to dazzle Earth’s night-time skies was Comet Hale-Bopp, which visited in 1997. Comet 17P/Holmes made a brief appearance in 2007.